Thanks for a timely, fair and interesting review! I like the Positron enough to buy two. The blade is actually just a hair over 3 inches in length; I wish it were just under. My two flip perfectly — easily but not as fast or as powerful as the latest Zero Tolerance flippers, which have a bit too much snap for my taste. I don’t find the beautiful CF handle at all chunky — it feels great in the hand. Two nits: the pointy end on the scales is a bit too pointy. And the cutout surrounding the tiny Spydie hole should be enlarged a little to allow the Positron to to be opened manually by sliding the thumb. I like that as an alternative to flipping. The Positron is my favorite Spydie of 2015 and one of my current favorite EDCs. I am glad you like this one too. That is an interesting observation about the pointy end of the scale. I see what you are saying, although I did not notice it as a hotspot in use. I agree, it would be nice to be able to use the thumb hole on this. This is a rare instance where Spyderco chose form over function – I am guessing to preserve the integrity of the design. My thought on describing the knife as chunky is that it appears thick for it’s size. I agree that it works well in the hand, and besides it “looking” chunky I don’t think the knife itself is overly heavy or bulky in use. I like my Positron for a $154 flipper with nice CF. I would’ve liked it more if access to the lock disengagement area was better. Also, the bottom of the handle is definitely too pointy. It’s a nice thin slicing blade. Very good flipper action on mine. The CF gives good traction but although the handle us 4 inches you lose some space due to the flipper tab acting as guard. It’s a tight grip for me and as such the clip digs into my palm. Overall, a likable and light EDC flipper. Thank you for stopping by. For $154 it’s a great deal. I paid around $170 for mine – not terrible. I see them currently retailing for $180. I’m less enthused the higher we creep towards $200, but at $154 that’s just a phenomenal deal. Good point about the lock bar disengagement. You have to cram your thumb in there. I will update the review with some thoughts on that. With Spyderco’s MAP enforcement going into effect on 1.1.2016 the street price of the Positron will be 40% off MSRP or $167.97. It’s still worth it at that price but I wish they had spent a little more time addressing some of the minor irritants like lockbar access and pointy bottom. I agree, Ramin. Those refinements would improve the knife. I’d never say that Spyderco should just blindly copy any and all trends in knife design. But, one of the major things I love about Spyderco is their willingness to make knives for EVERYONE(see multiple knives designed for a single country, or even a single CITY, to fit draconian knife laws; a whale rescue knife; the Salt series; the ARK… plenty of examples). I think this knife fits into that, as well as the “Unbelievably good Spyderco + Custom Maker collaboration” category. The knife will appeal to those who look at smaller, slender knives with a bent towards the Gentleman’s Folder look. I absolutely agree about having the option of using the hole; barring this thing, I’d be getting a Domino for my first Spydie flipper for just that reason. But I think that the function here isn’t like a Delica or PM2 or one of the other “working knives”; it’s more the function is to 1) Embody Southard’s design 2) be a pure Gent’s Folder flipper with a super slim profile. This thing just fills one of the many many slots in Spyderco’s product line: pure flipper. They can make this thing as a collab, and not get accused of abandoning the thumb hole or something stupid(see Valloton Sub-Hilt for a Spyderco with thumb studs), and if any deployment method is close to the SpyderHole for ease of use and accessibility it’s probably the flipper. TLDR: I think the no-hole choice is great, and I can’t wait to buy mine. You make a very good point. 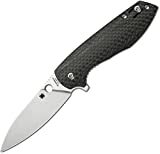 Spyderco has a diverse range of offerings – for all kinds of applications and preferences. Personally, I really like mine and I don’t mind that the thumb hole is not functional. Let me know what you think of yours if you end up pulling the trigger. Decisions, decisions! Either knife is nice, but my Positron is getting lots of pocket time these days. Let me know what you think when yours arrives. Cheers! I see your point, and there are definitely some parallels between the 2 knives (the clip, the use of carbon fiber, etc). However, if you handle the 2 knives side by side they have a much different feel – especially since the Caly is made in Japan. The new Spyderco Mantra shares many of the lines of a traditional Spyderco, including the Caly 3, and has much closer profile. But that one has a full titanium handle. Who knows, maybe they will swap the Titanium for CF one day? +1 to that. Much like how the Caly 3 (to me anyways) feels like a more-refined Delica, the Mantra feels like a more-refined Caly 3. Honestly I handled the Mantra once and the Positron dropped a couple of spots on the list. The Positron is good, but it’s now outclassed by products from other companies, as well as by other new products from Spyderco. I handled a TRE at Blade Show – it’s beautifully made but the action wasn’t particularly good and I am not sure I prefer it over the Positron. The Rubicon is a much different knife (far bigger, flashier, and bulkier – more of an art piece than a true EDC). I haven’t handled an Air, but it’s a small knife, no pocket clip, or flipper. It will feel a lot different from the Positron. I have the Positron and TRE which I’ve carried for EDC. I like them as both look non-threatening and sized just like a Swiss Army Knife. But in terms of overall quality, details, and flipping action, I have to say that there is no comparison between the two. Also, there seems a lack of premium feel in the Positron’s finish which unfortunately I find it overpriced even at only $168 after 40% off (makes Kizers all look like a bargain). But then, the TRE even in G-10 finish is generally more expensive than the Positron although it uses M390 blade steel vs S30V. I’d check out the Spyderco Mantra. Personally I prefer it to all of the Spyderco knives you’ve mentioned, including the Positron. I haven’t handled the Lionsteel but Everyday Commentary likes it a lot. But for myself, being a Spyderjunkie, I’d pick the Mantra or Mantra2.